BERKELEY, CA � An advanced, energy-efficient laboratory fume hood technology developed by scientists at the U.S. Department of Energy's Lawrence Berkeley National Laboratory (Berkeley Lab) has passed standard tests for fume hoods and is now ready for field-testing at an advanced lab facility planned for Montana State University at Bozeman. The technology is being developed by a team of Berkeley Lab researchers led by Dale Sartor and Geoffrey Bell of the Environmental Energy Technologies Division. "The new fume hood technology uses only 30 percent of the airflow of standard laboratory fume hood installations," says Bell. Sartor adds, "We estimate that in California alone, the efficient technology could save 360 gigawatt-hours (GWh or billion watt-hours) of energy per year." That might result conservatively in an annual cost savings of $30 million, he says. Nationwide, the total savings is estimated to be ten times higher. For comparison, one energy-intensive industrial sector, semiconductor manufacturers in California, consumed about 1,500 GWh of electricity in 1997, according to California Energy Commission data. Fume hoods are ubiquitous in industrial, medical, and university research facilities. They are box-like structures often mounted at tabletop level with a movable window-like front called a sash. 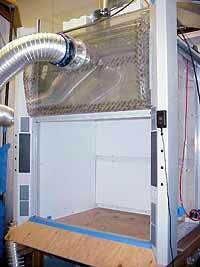 Fume hoods capture, contain and exhaust hazardous fumes created during industrial processing or laboratory experiments. The fumes are drawn out of the hood by fans through a port at the top of the hood. Pharmaceutical and biotechnology facilities have hoods, as do facilities ranging from industrial shops, to medical testing labs, university research labs, and high school chemistry labs. "Fume hoods typically require large exhaust flows and are usually never turned off, so they use a tremendous amount of energy both in fan power and in heated and cooled room air," says engineer Bell. The design of laboratory buildings -- exhaust capacity, duct size, fan power requirements, boiler size and chiller capacity -- is heavily affected by the number and size of fume hoods in the facility. "The new fume hood technology could save hundreds of thousand of dollars per year in energy costs at a typical multi-laboratory facility," says Sartor. A typical fume hood, perhaps six feet wide and two to three feet high, circulates air through its sash at 100 feet per minute. The energy to filter, move, cool or heat, and in some cases, scrub (clean) this air is one of the largest loads in most lab facilities. In the conventional fume hood design, air is sucked in through the sash and vented out the top. The Berkeley Lab design uses a "push-pull" approach to contain the fumes and move the air. Small supply fans are located at the top and bottom of the hood�s face, pushing air into the hood and into the user�s breathing zone, setting up a "divider" of air at the face. The air divider prevents fumes from reaching the user standing in front of the hood. Consequently, the exhaust fan can be operated at a much lower flow. Current research has reduced the flow to 30 percent of a typical hood installation. Because less air is flowing through the hood, the building�s environmental conditioning system can be downsized, saving both energy and initial costs of construction. With the successful testing of the new prototype fume hood complete, a private company, Fisher Hamilton Inc., will build a commercial unit for testing and demonstration at a new pilot facility at Montana State University. MSU's EPIcenter Project is an ambitious plan to construct a multidisciplinary educational building, whose goal is to be the prototype of a 21st century academic laboratory, incorporating advanced design principles and sustainable building construction and practice. Berkeley Lab is one of MSU's partners in the design phase. Construction of a pilot facility to demonstrate some of the advanced design concepts to be used in the EPIcenter is expected to begin in mid-2000. Says Kath Williams, Executive Director of the EPIcenter project, "Bringing the work of the national laboratory to commercialization is a jointly held goal of the EPIcenter project and Berkeley Lab. With the help of Fisher Hamilton, we will be able to dramatically change the energy efficiency of fume hoods while protecting the health and safety of the researchers and lab personnel." There has also been other interest in the technology. According to Sartor, "ATMI Inc. has signed an agreement with Berkeley Lab to develop a version of the fume containment technology appropriate for semiconductor manufacturing facilities. The technology has the potential to reduce operating costs and increase chip fabrication yield." Additional members of the team that developed the fume hood technology are Chris Buchanan, William Fisk, Darryl Dickerhoff, and Doug Sullivan of the Environmental Energy Technologies Division. Former Berkeley Lab researcher Helmut Feustel initiated development of the technology in 1995. Berkeley Lab has applied for a patent of the low-flow fume hood technology, which is available for licensing through the Technology Transfer Department.